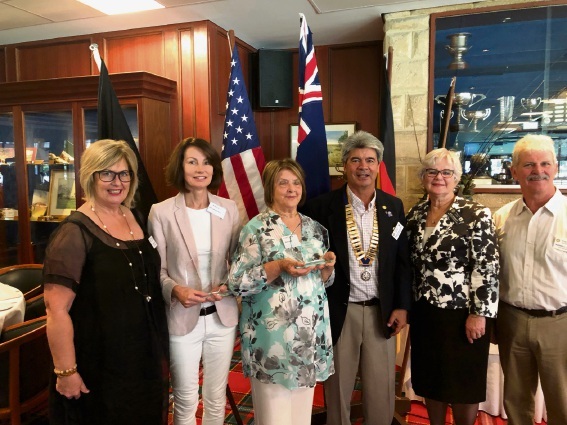 Julie Broad (left), Kelly Backshall, Marjorie Barker, Mill Point Rotary President Rick Sneeuwjagt, South Perth Mayor Sue Doherty and Russell Lanyon. KELLY Backshall’s dedicated volunteer work at Food Rescue has earned her a Mill Point Rotary Club Unsung Hero Award. Food Rescue is a UnitingCare West program that feeds disadvantaged people. Ms Backshall began volunteering for the program in June 2014 as a sorter and packer at its Belmont warehouse. Since then she has worked in all areas of the Food Rescue operation and most recently took on the role as a program facilitator to teach low socio-economic residents how to cook using rescued food from the Food Rescue Fresh Food boxes, which have received funding from Mill Point Rotary. Ms Backshall is now developing content for newly acquired iPads so that data can be captured efficiently, which will free volunteer administration staff to focus on value-adding to the data captured and providing tailored information back to UnitingCare West, sponsors and other stakeholders. The Rotary Club’s Unsung Hero Award was initiated in 2011 to recognize and celebrate the efforts of individuals who have over many years contributed to the quality of life in a community without reward or recognition. Marjorie Barker also received an award for her work at the Old Mill in South Perth. For more than 40 years, Ms Barker has welcomed guests to the heritage building and encouraged visitors to explore and reflect on WA’s colonial past.